It took about five seconds from the time Siale Angilau grabbed a pen from his defense attorney’s table for him to run across the federal courtroom floor and sail headfirst into the witness stand, where he was fatally shot by a U.S. marshal. On Monday, Salt Lake City’s U.S. District Court released courtroom video of the 2014 shooting, nearly four years after the 25-year-old defendant was shot four times. Angilau, a member of Salt Lake City’s Tongan Crip Gang, was on trial for racketeering April 21, 2014, when a former gang member, Vaiola Tenifa, began to testify for the prosecution. Tenifa told the court about the gang’s practices, including how boys as young as 9 are recruited and how they must put in “work.” That can include beer thefts, robberies and shooting at opposing gang members, he said. Tenifa had been on the witness stand for 22½ minutes when the video shows Angilau standing up from his seat beside his attorney, picking up a pen from the defense table and charging. A shackled Tenifa begins to back up as he spots Angilau rushing toward him. Angilau lunges headfirst over the witness stand with his arm raised, ready to strike, and narrowly misses Tenifa, who swivels around the back of the witness stand. Simultaneously, a marshal fires four fatal shots. Tenifa is standing feet away from where Angilau lands in the witness box, the video shows. “Drop the pen out of your hands!” someone else yells. “Stay right here, don’t move,” another voice commands. The address is actually 351 S. West Temple. Angilau’s trial, presided over by Judge Tena Campbell, was the first in the new courthouse. Angilau was pronounced dead at a hospital. A federal judge, who on Friday dismissed a wrongful death lawsuit from Angilau’s family, the same day ordered the footage be released to journalists who intervened in the lawsuit to unseal the video. The version of the video that Judge John E. Dowdell ordered to be unsealed is somewhat redacted. Faces of the marshal and jurors are blurred to obscure their identities. The news outlets that pursued release of the video include The Salt Lake Tribune, print and broadcast outlets from Salt Lake City, the Utah Headliners Chapter of the Society of Professional Journalists and The Associated Press. Dowdell’s rulings represented mixed results for the U.S. Department of Justice and the Angilau family. The Justice Department maintained that the marshal who killed Angilau protected the courtroom that day, and that disclosing the video would further inflame gang members who had threatened retaliation against law enforcement after the shooting. The Angilau family contended the marshal used excessive force on a man armed with only a pen. They supported journalists’ efforts to see the video. Audio from the shooting was made public in August 2017. Dowdell said it was clear that Angilau’s actions necessitated the marshal’s deadly response and that Angilau’s rights were not violated. The marshal has been identified only as “Doe” in court filings. The Angilau family’s attorney, Bob Sykes, said Monday morning he had not yet had an opportunity to discuss an appeal with his clients but hoped to do so “shortly.” Sykes acknowledged it was a tough case for the judge, but said he was disappointed in Dowdell’s ruling. 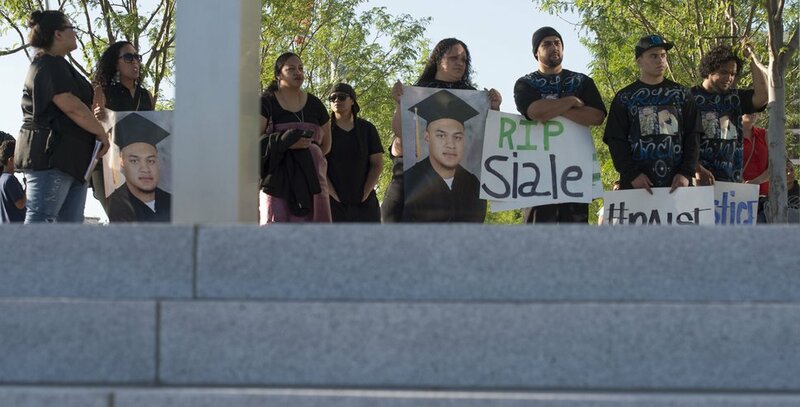 Steve Griffin | The Salt Lake Tribune Family, friends, and supporters of Siale Angilau, who was shot and killed in the Salt Lake City federal courthouse, gather for the Justice4Siale Vigil on the courthouse plaza in Salt Lake City, Utah, Wednesday, June 11, 2014. Glendale community members have organized a coalition called the "Raise Your Pen Coalition." “When the shots are fired, [Angilau]’s over the witness box and he’s going down,” Sykes said, adding that the witness is out of harm’s way when the marshal starts firing.